Do you want to stay away from the surprise of a flat tire when on the road? If yes, you must ensure that your car tires always stay in top condition. Tires that are underinflated result in uneven as well as fast wear and tear which may lead to sudden flat tires. To prevent such occurrences, you should get a reliable digital tire pressure gauge and check your car’s tire pressure on a regular basis. 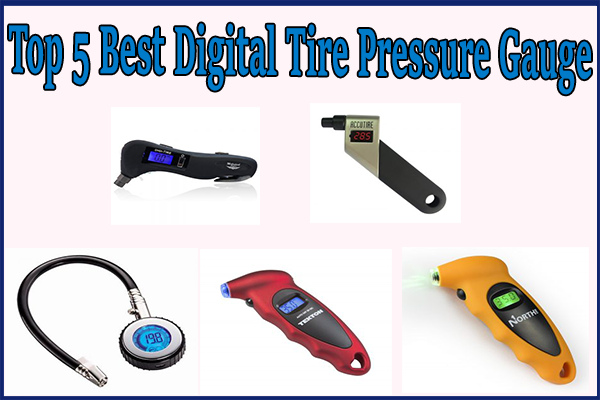 What To Look For in a Digital Tire Pressure Gauge? A) What is the PSI range of your tires? You should get a digital gauge which will work within the pressure range of your vehicle’s tires. 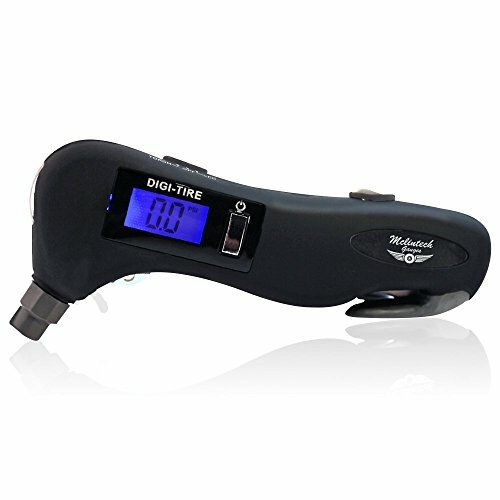 If the standard PSI levels of your tires is 30 PSI, then you need to get a 60 psi digital gauge. If it is 15 PSI, then you need to buy a 30 psi gauge. Remember that digital tire gauges work the best in the midpoint of their range. B) How easily can you read the gauge display? Digital gauges which have backlit displays and large digits can be read easily. Gauges having nozzles to seal the valve give you accurate readings. C) Will you use the gauge in low lit areas? If yes, you should get digital gauges having lighted nozzles and backlit displays. D) Will your digital tire gauge have a storage case? Where and how will you store your digital tire gauge? 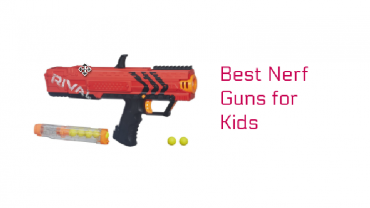 You don’t want it to bounce around in your car’s glove compartment as that will decrease its accuracy. E) Does your digital tire gauge allow bleeding of air? In case there is excess air in your tires, will your digital tire gauge allow bleeding of excess air? Some gauges come with this facility even though they may be more expensive than gauges which do not. F) How much does your digital tire gauge cost? As a rule of thumb, the more expensive digital tire gauges have more features. But you might not need all of those features. Make a shortlist of a few gauges and select which features will be helpful. Then buy the best gauge for your budget. 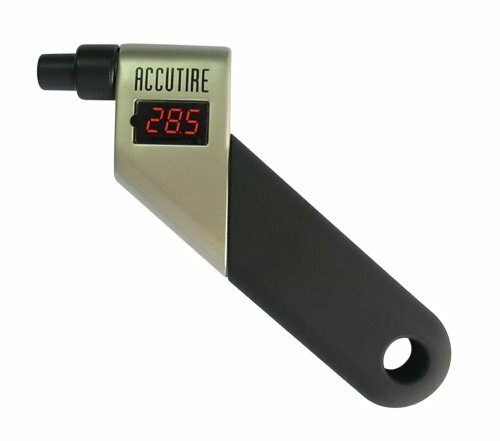 Accutire’s MS-4021B digital gauge does exactly what it is supposed to do without any bells and whistles. The gauge measures tire pressure from 5 to 150 PSI in increments of 0.5 PSI. The accuracy level is sufficient for cars as well as commercial vehicles. It has a LED powered large display making it easy to read. Engineered for ease of use and longevity, this gauge has an easy to grasp rubber handle. A really handy feature is a hole in the handle’s bottom which allows you to tie it to your belt. The gauge has an auto shut off feature which helps prevent deflation of your tires. Weighing just 0.6 ounces, it is lightweight and powered by internal lithium batteries which last a long time. The 5 in 1 tire pressure gauge from McLintech has various tools to help you in the case of emergencies. It has a seat belt cutter, a window hammer which pops out if you need to make an emergency exit from your car, a red safety light, and a LED flashlight to work in the dark. This gauge’s primary function is to definitely to check the pressure in your tires, and it does it well. It can measure tire pressure in increments of 0.5 PSI up to a whopping 150 PSI which means you can use it on a broad range of vehicles. Coming with a rubber grip, you can get a proper grasp while measuring tire pressure. The MS-5510B Racing Tire Gauge from Accutire is one of the very best digital tire pressure gauges around. Highly reliable and super accurate, it comes with a long pipe attached to the meter. As a result, you can stay a safe distance away from your tires. It can measure tire pressure from 0 to 60 PSI in increments of single decimals. It has an easily read display allowing you to use the gauge either at day or night. The gauge comes with an inbuilt bleed valve enabling you to let air out if filled in excess in your tires. It is comparatively higher priced than other gauges on our list, but you can’t beat it for accuracy and reliability. 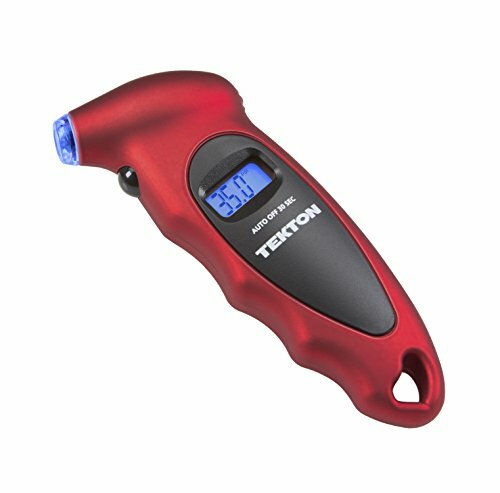 Another great digital tire pressure gauge is the Tekton 5941 digital gauge which is economically priced. 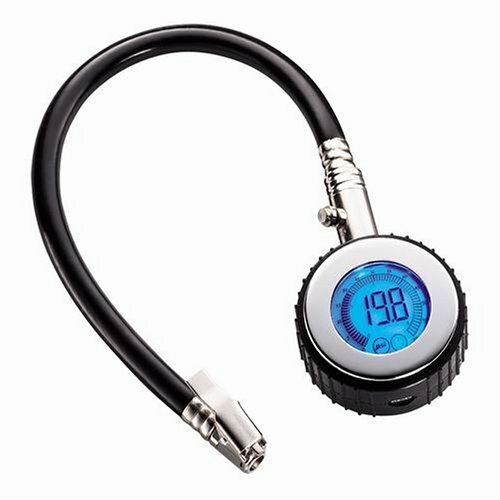 It has a backlit display screen and a nozzle that is lighted which makes this gauge perfect for use in dim light or at night. A unique feature is an auto switch-off which kicks in after 30 seconds, which helps you save battery life. It measures up to 100 PSI, making this gauge perfect for the majority of vehicles. It’s nozzle seals over the tire’s valve system preventing leakage of pressure after you complete the pressure check. It has an ergonomic design allowing it to fit in a comfortable manner in your hand. The handle is non-slip which makes for an excellent grip. 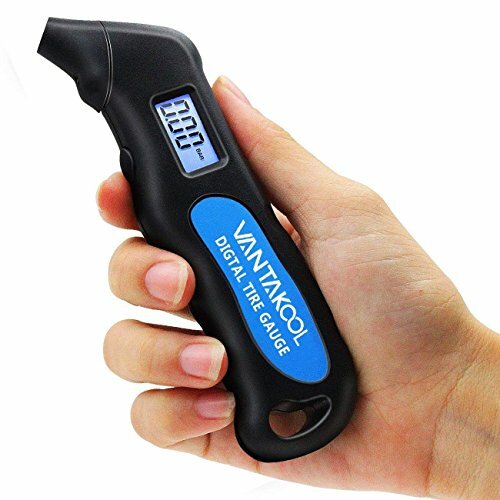 Another reasonably priced digital pressure gauge, this can monitor tire pressure from 0.5 to 100 PSI in increments of 0.5 PSI. It can measure in PSI, Bar, Kg/cm or Kpa. It has a single button which is used to switch on the device, change settings and switch off. You should, however, use this device only in temperatures ranging from 5 degrees to 50 degrees Celsius to ensure accuracy. The impressive part is that NorthONE gives you a 100% guarantee of satisfaction. That means if you are dissatisfied with this digital tire pressure gauge, you can get in touch with them and get your entire money back!